A sanctuary, a tranquil oasis, where you can find serenity and harmony in hectic Silicon Valley. The architecturally stunning guesthouse offers a full bath, a well-stocked kitchenette, and a beautifully curved countertop that looks out onto the Asian-inspired backyard. Tucked away in the back of the garden, offering much privacy. The high ceiling, 3 skylights, and 2 columns of glass blocks bring in much light. A private outdoor sitting area overlooks a koi pond with a natural rock waterfall. This stellar guesthouse, built in 2010, is in the spacious backyard of a lovingly restored Craftsman home that just celebrated her 100th birthday. An intricately carved life size Thai Sawadee statue standing between two towering antique Chinese gates welcome you to this zen sanctuary where you can relax, find peace and harmony at the end of the day, rejuvenating your mind and spirit. The koi pond has a natural rock waterfall, a floating bridge, and two vigilant antique stone buddhas who watch over the twelve koi, some of them over 20 years old. The guesthouse is tucked away in the back of the property (6500 sq ft lot) so it is very quiet, with your own private entrance, guarded by a stone monk from China. Step inside and the amazing architecture will take your breath away. The high ceiling, 3 skylights and 2 columns of glass blocks bring much light in well into the evening. There is a sitting area has a leather couch and 4K smart TV with full cable and high speed internet services. The well-stocked kitchenette includes microwave oven, toaster oven, electric kettle, coffee maker, washer/dryer and refrigerator. A spacious and luxurious bathroom has a unique walk-in shower with multiple jets and shower heads. The beautifully curved bamboo counter top overlooks the koi pond, enjoy a meal there or make it a work station. In the sleeping area are an armoire and a platform bed with a Queen size mattress, offering storage space underneath. 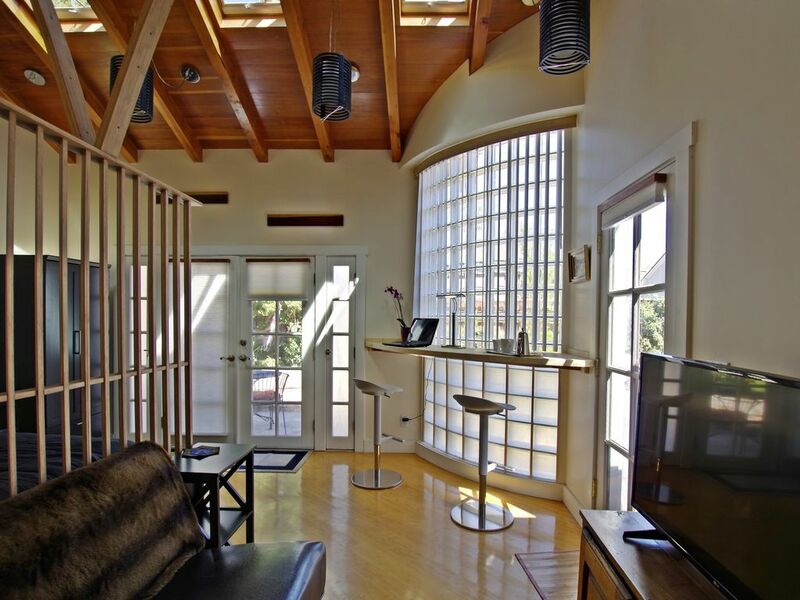 Open the French doors to a private sitting area next to the koi pond where dragonflies and hummingbirds dance around. Close your eyes and allow yourself to drift away with the sound of the waterfall. Or sit on the bench in the breezeway and enjoy the backyard from yet another perspective. No fishing, please! Guests access to the entire living area of the guesthouse, patio and backyard, except the deck that is attached to the main house as well as the main house. You can access the studio from the driveway and a secured gate. Street parking only. We are your hosts, Jean and Grace, and we live in the main house. Please do not hesitate to let us know how to make your stay more comfortable and pleasant. The property is located in the prestigious historic Hanchett Park where most homes with deep lots were built at the turn of the century. Every house has its own unique style, many of which were designed by famous architects. Pride of ownership is evident in this neighborhood where all the streets are wide and treelined, making it a great place to take a leisure stroll. Walking distance to many restaurants, coffee shops, Wholefoods, Safeway, Caltrain station, and the award winning Municipal Rose Garden. You are just minutes away from all the major commute routes (Highway 880, Hw 17, Hw 280, Hw 87, and Hw 101), public transportation (buses and Lightrail), and walking distance to the downtown San Jose Caltrain station. Located in the heart of Silicon Valley with convenient access to adjacent cities: the house is in Midtown San Jose, next to Santa Clara, and 10 minutes to the San Jose Airport. It is a short drive to Campbell, Cupertino, Sunnyvale, Los Altos, Los Gatos, Saratoga, and Mountain View. A bit further north are Menlo Park and Palo Alto. Santa Clara University is a 5 minute drive, Harker is 10 minutes, San Jose State just 15, and Stanford University is only a 25 minute drive north on highway 280. Fremont and Milpitas are a short jaunt to the east, and further south is Gilroy and Morgan Hill. The Santa Cruz Beach boardwalk is a quick 45 minute drive west over beautiful highway 17. Major sporting and entertainment venues in close proximity - walking distance to SAP Center in downtown San Jose (Home of the San Jose Sharks and major concerts and performances), 10 minute drive to Levi Stadium in Santa Clara (Home of the San Francisco 49'ers and host to other major entertainment/events), and Avaya Stadium in San Jose (Home of the San Jose Earthquakes and other world class sporting events). In addition, for wine lovers at heart there are also several wineries nestled in the Santa Cruz mountains 15 to 20 minutes away. All single family houses built between 1910 and 1930 in historical neighborhood of San Jose. Thank you for staying with us again and for another great review. All the best!! Fantastic property. Great hosts. We will be back!! A fantastic property with wonderful hosts. This amazing guesthouse was ideal for our visit to see our daughter during Parents' Weekend at Santa Clara University. The location was perfect, with numerous restaurants of all types within walking distance and only about two miles from campus. The guesthouse itself was warm, inviting and every detail was accounted for. Grace and Jonno were incredibly welcoming and appropriately attentive. Thank you so much for allowing us to visit. We will be back. Thank you, Martin and Nancy, for your wonderful and thoughtful review. It was an immense pleasure hosting you and meeting Frances. Thank you especially for staying with us and being such lovely guests. We look forward to seeing you again and to hopefully meet Frances' siblings. All the best!! We have stayed in many VRBOs and this is the first time we have taken time to write a review. Jonno and Grace are exceptional hosts. We had the privilege of getting to know them personally. They gave us space and they were helpful, gracious and responsive. We experienced unique and memorable parts of San Jose and surrounding area because of their helpful suggestions. We had the advantage of local knowledge. The place we stayed in is small, but has everything we needed and more. The backyard is exquisite. We enjoyed our own private space situated below a beautiful lemon tree. We highly recommend this property to anyone who is looking for a quiet get away. This is a perfect location for day-time excursions. We are happy we rented a car to visit other close-by, unique places. If we return to San Jose, we will happily stay here again. It was an immense pleasure hosting Adrienne and Bob, who were genuinely warm, friendly, and respectful. We were so happy that they took time to appreciate every little detail of our property. Thank you, Adrienne and Bob, for being such lovely guests and for your wonderful and thoughtful review. All the best! Jonno and Grace were wonderful hosts and the property was beautiful! Great location, walking distance to everything you might need. This was such a super cute place, great neighborhood, tranquil backyard, the family thought of everything and were so sweet! The location is Close to everything. I’m looking for another reason to go back to Cali so I can stay there again. Thanks for the making our trip special. It was just lovely hosting you, wish you could have stayed longer. There are many reasons to come back.....Santa Cruz and San Francisco are only one hour away, and then there is Monterey, Carmel, wine country, Lake Tahoe...we certainly hope to see you again. All the best to you both and Tillman!